Origin: Widely spread across Africa. Temperament: Very Peaceful but timid. Company: Other small peaceful fish, Nothing big enough to eat them. Sexing: Males have longer and pointer fins unlike the females who have shorter and rounder fins. Breeding: Easy to breed. They lay their eggs among fine leafed plants. The eggs can be moved and hatched in a fry aquarium. 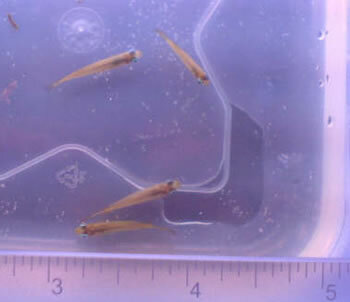 The fry can be left to grow up with their parents in larger aquariums with a lot of plants. 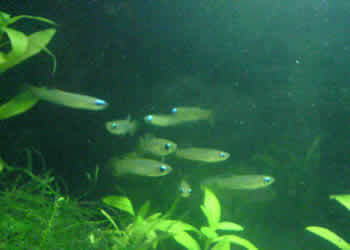 Other Information: Aplocheilichthys Normani is a small hardy fish and is good for beginners. They can be kept in small tanks and like to be kept in groups of 5 or more. They all completely grey with black eyes with blue ‘lamps’ on the top. They look best against live plants and in bigger groups. Generally slow and peaceful but when shocked will dart quickly around, lose ‘lamp’ temporarily and even jump. So be careful as not to scare them.